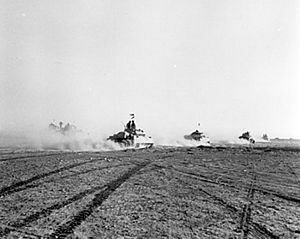 Picture - British tanks advancing under fire at the Second Battle of El Alamein during World War II. Much of the application of armoured warfare depends on the use of tanks and related vehicles used by other supporting arms such as infantry fighting vehicles and self-propelled artillery, as well as mounted combat engineers and other support units. The doctrine of armoured warfare was developed to break the static nature of World War I trench warfare on the western front, and return to the 19th century school of thought that advocated manoeuvre and "decisive battle" outcomes in military strategy. Modern armoured warfare began with the need to break the tactical, operational and strategic stalemates forced on commanders on the Western Front by the effectiveness of entrenched defensive infantry armed with machine guns-known as trench warfare. Under these conditions, any sort of advance was impossibly slow and occasioned massive casualties. The development of the tank was motivated by the need to return manoeuvre to warfare, and the only way to do so was to protect soldiers from small arms (rifle, machine gun) fire as they were moving. Tanks were first developed in Britain, as a way of navigating the barbed wire and other obstacles of no-man's land while remaining protected from machine-gun fire. The manoeuvrability of the tank would at least in theory regain armies the ability to flank enemy lines. In practice, tank warfare during most of World War I was hampered by mechanical failure, limited numbers, and general underutilisation. British Mark I tanks first went to action at the Somme, on September 15, 1916, but did not manage to break the deadlock of trench warfare. In the Battle of Cambrai (1917) British tanks were more successful, and broke a German trenchline system, the Hindenburg Line. After the disastrous final German offensive, tanks were used at the Battle of Soissons and the Battle of Amiens, which ended the stalemate imposed by trench warfare on the Western Front, and thus effectively ended the war. Following the First World War, the technical and doctrinal aspects of armoured warfare became more sophisticated and diverged into multiple schools of doctrinal thought. In the Soviet Union during the early 1930s Red Army and German officers collaborated in developing use of tanks based on 2nd generation vehicles using turreted main weapons, and experimenting with different chassis configurations and drive trains. One important acquisition for the Red Army turned out to be the purchase of a T3 chassis from an inspired US designer J.W.Christie which served as the basis of the Soviet BT series of fast tanks. The Red Army in particular was much influenced by the theoretical works of Marshal Tukhachevsky that led to development of infantry support heavy tanks and fast 'cavalry' tanks for use in the theory of deep operations similar to the German blitzkrieg. This development led to the intent by the Red Army to form a massive tank force of thousands of vehicles. Modern armour warfare doctrine developed during the years immediately preceding World War II, in most cases with the tank seen as an infantry support weapon in the breakthrough of defense lines role. A fundamental key to conventional warfare is the concentration of force at a particular point on the enemy's defense line seen as either weak or offering other tactical, operational or strategic advantages. Concentration of force increases the chance of victory in a particular engagement through application of one of the Principles of War-Mass. This point, if correctly chosen and exploited, assures a greater chance of success in a given tactical engagement or a small number of operational engagements which are often sufficient to win a strategically decisive battle. The German term that later came to define the building of such a concentration at a given point is Schwerpunktbildung, which can be translated as "development of a centre of effort". From this it is derived that twice as many tanks will quadruple the relative firepower - relative that is, to the amount of firepower the enemy has per member of the friendly unit; one could also express this by saying that their relative punishment from enemy action is reduced four times, which is the same thing - as not only their own absolute number is doubled, but the number of enemy tanks relative to each of their own, is thereby halved also. When the German tanks actually had to fight the UK infantry tanks in 1940, they were severely discomfited-but recovered to drive the British army out of continental Europe. At the start of the German invasion, France possessed more tanks and, in one-to-one terms, better tanks, than the Germans. However, what mattered was how the tanks were used, and French command distributed half of its tanks among independent Bataillons de Chars de Combat (battle tank battalions) for infantry support, rendering them tied to decision-making of the local army commanders. In 1940 the German command concentrated its tanks into Panzer divisions and used them for strategic envelopment, smashing their way through the French defensive line, and driving towards The Channel, threatening to sever communications and supply lines with the national centres of logistic support. To counter such attacks, a mobile anti-tank force must be held in reserve and moved to meet the attack. The French had no strategic reserve at all; let alone a highly mobile reserve as their three Cavalry armoured divisions (Divisions Legeres M�caniques or Mechanized Light Divisions), the only armoured units organized on the lines of the German armoured divisions, had already been committed in the Low Countries, which was crucial in the French failure to counteract the German penetration, as the four French Infantry armoured divisions lacked sufficient strategic mobility. However, later in the campaign a new tactic was applied which proved highly resistant against tank attacks. This was called the hedgehog. However, due to the losses already sustained, the French could never counterattack, and the hedgehogs were eventually by-passed by the German troops. It was only towards the later years of the war, with the invasion of the European mainland, that the Allied Armies began to become more effective in armoured warfare. In 1942 and 1943 , the Allies consistently lost armoured battles in the North African desert due to improper tactics; in particular, running armoured formations into opposing anti-tank positions. Much of the Red Army development in tank use was based on the theoretical work carried out by such officers as Tukhachevsky and Triandafillov in the mid to late 1930s. This was as part of the two-directioned concepts, one being infantry-centred "broad front" and the other being a "shock army". While the infantry based part of the doctrine demanded "powerful tanks" (heavy tanks armed with infantry guns and machineguns) and "tankettes" (light, often amphibious tanks with machineguns), the shock Army demanded "manoeuvre tanks" (fast tanks with medium guns) used in conjunction with motorized forces and "mechanized cavalry" that would operate in depth as "strategic cavalry" combined with nascent airborne troops. These ideas culminated in the "PU-36" or the 1936 Field Service Regulations. At the start of the Second World War much of the Red Army, including its armoured forces, were in transition and recovering following the 1937 repression of the officer corps and the consequences of the Soviet-Finnish War of 1939. The Red Army tank fleet was extremely large, consisting of some 24,000 vehicles, but many were obsolete or unfit for service due to difficulties with supplying spare parts and lack of qualified support staff. Almost half of the tank fleet was lost in the first month of the war. The Red Army's initial strategic withdrawal relegated the armoured forces to a secondary role, however one important development took place shortly before the war which was to influence Soviet armoured doctrine and tank design for a decade: the creation of the T-34. Developed on the Christie suspension chassis and using for the first time sloped armour, the T-34 proved a shocking surprise to the German forces with its high velocity 76.2 mm tank gun. Using wide tracks the T-34 was also able to negotiate terrain in difficult weather conditions, something that persistently dogged the German designs. Assessing the success of the German Blitzkrieg strategy, operational methods and tactics, it was concluded that the Red Army should return to the use of operational methods developed before the war, and indeed the Tank Armies were eventually created. To complement the T-34 other designs of heavy tanks and self-propelled artillery and tank destroyers were also designed. Much of the use of Red Army's armoured forces were used in concentrations during all Red Army WW2 strategic-operational operations, initiated under strict secrecy and using the Principle of Surprise. This development, largely under the influence of Heinz Guderian's Achtung-Panzer!, was facilitated by the fact that for political reasons a Tank Arm had been formed, the Panzertruppe or Panzerwaffe, distinct from the Infantry and Cavalry. The Panzertruppe however was until 1940 overshadowed by the much more influential Infantry, as exemplified by the low priority given to tank production and the fact tanks were between 1936 and 1939 also divided among the Infantry and Cavalry. Guderian, with the help of others, established the armoured combined arms team, distinct from a purely infantry or cavalry formation. The panzer divisions were not solely composed of tanks, but integrated the other arms in it as well - most notably, mechanized infantry (riding in halftracks to be protected from small-arms fire while being transported) and self-propelled artillery (howitzers fitted on a tank chassis). This allowed the panzer division to become a complete and independent combat force, and overcome the problems that tanks had in attaining a breakthrough against strong opposition by entrenched enemy infantry equipped with large numbers of antitank-guns, which would be very costly without direct infantry support. Infantry had always had problems keeping up with the speedy tanks; now they could simply drive along with them. However, this development was hampered until 1941 by the lack of half-tracks vehicles to equip the mechanized infantry. The in-depth research through theoretical approaches, wargaming and exercises developed a confidence within the Panzertruppe itself (and political support by Hitler) in the armoured formation as the key battlefield formation - although this view was before 1940 not shared by the other Arms of Service. A key part of this doctrine was improved communications by having radios in all tanks - and again this ideal suffered from technical limitations as most tanks had receiver sets only. The superior tactical and operational doctrine combined with an appropriate strategic implementation enabled the Germans in 1940 to defeat forces quantitatively superior in armour, infantry and artillery during their campaign in France; but just when Blitzkrieg was made a deliberate doctrine, in 1941, it ultimately failed on the eastern front, though attaining at first spectacular successes. These vehicles, like the Sturmgeschx�tz III, outnumbered the German tanks and destroyed numerous Allied tanks on the battlefields of Europe. They were part of very effective general anti-tank tactics that included the use of anti-tank teams armed with Panzerfx�uste (small recoilless rifles), anti-tank guns and extensive anti-tank minefields. However, they made a successful use of Blitzkrieg tactics very difficult. Though the U.S. had established the Tank Corps in WWI using French Renault FT (and Six Ton Model 1917 tanks, copies of Renault FTs) and British MK tanks, and some officers like Dwight D. Eisenhower and George S. Patton, Jr. emerged from that war initially as avid proponents of continuing and developing an American armoured force, the rapid reduction of the forces and apathy and even antipathy towards funding and maintaining armed forces in the inter-war years led to relative stagnation of armoured doctrine in the United States. Adna R. Chaffee, Jr., virtually alone, advocated for the future of armoured warfare and the development of appropriate training, equipment and doctrine during the late 1920s through the 1930s. The United States Army had always regarded the French Army as the best army in Europe, and consequently the US Army frequently copied French uniforms (the US Civil War), airplanes, and armour (Renault FT tank). Only when France was conquered in "just six weeks!" in 1940 did the US Army become "shocked" into re-thinking the influences by the perceived actions of German tanks in the 1939 Polish Campaign, although its Armored Combat Arm was not created until 1940 when The Armored Force was born on July 10, 1940, with the Headquarters, Armor Force and the Headquarters, I Armored Corps established at Fort Knox. On July 15, 1940, the 7th Cavalry Brigade (Mechanised) became the 1st Armored Division; the 7th Provisional Tank Brigade, an infantry tank unit at Fort Benning, became the 2nd Armored Division". The Tank Battalion was established at Fort Meade, Md., and a small Armored Force School was also established. The popular conception in the US was that tanks had been used boldly as part of a new system of war called Blitzkrieg. Under General Jacob L. Devers, Chief of the Armored Force, doctrine evolved into a combined arms operational force consisting of primarily infantry, artillery, and tanks with tanks being the major manoeuvre component. Under this doctrine, US tank crews of both armoured divisions and GHQ tank battalions were taught to fight tanks in tank on tank engagements. Armored Force personnel during and after the war criticized the infantry for using the GHQ tank battalions assigned to infantry divisions strictly as infantry support. It was believed that conventional tanks that could take on the enemy Panthers and Tigers toe to toe would not have the speed and mobility to avoid being flanked and bypassed and therefore would not have the chance to fight. It was also calculated that US interests would be better served by large numbers of reliable (battleworthiness) medium tanks rather than a smaller number of un-reliable heavy tanks. It was decided therefore to slow the production of the US heavy tank designs such as the M26 Pershing and concentrate resources on mass producing the M4 Sherman and tank destroyers such as the M18 Hellcat. Since the Sherman medium tank would be inferior to the enemy heavy tanks they would have to avoid tank-vs-tank combat as much as possible, leaving enemy tanks to the tank destroyers. To be able get into position to counterattack, the tank destroyers had to be fast. To achieve the desired mobility and agility from the engines available the armour protection was sacrificed, a measure of protection coming from being nimble and hopefully from being able to knock out the enemy before they could get a shot in. Although they had guns of around about 76 mm, the tank destroyer units were issued with the ancestor of the modern Armour-piercing discarding sabot, rounds which made their guns much more powerful than a simple comparison of calibres would suggest. The Republic of China's National Revolutionary Army has only one mechanized division during early stages of the war, the 200th Division, which used pre-WWII tanks acquired from Italy, Germany, and the Soviet Union. While attempts to defeat the tank were made before WW2 and during WW2 though use of conventional high velocity artillery, this proved increasingly difficult in the post-WW2 period due to increased armour protection and mobility of the tanks. Another path taken toward defeating the tanks surprisingly came from the country with the largest armoured fleet in the world at the time, the USSR. 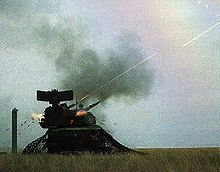 Soviet designers strove to incorporate some measure of anti-tank capability into almost every infantry weapon, and in the 1960s designed and deployed portable anti-tank wire guided missiles that could be either carried by the infantry, or fired from the newly developed BMP-1 infantry fighting vehicles. In 1973, Israel's Army failed to anticipate the importance of the introduction of anti-tank guided missiles on the battlefield in large numbers. Hundreds of AT-3 Sagger man-portable anti-tank guided missiles (ATGMs) supplied to Egypt by the Soviet Union which could be operated by the common infantryman without having to undergo extensive training inflicted heavy losses on Israeli tanks. Since then, ATGMs have played an important role within Israeli forces also, having developed advanced domestic-made versions (see Spike/Gil missile) which have been widely-exported throughout the world. In the recent 2006 conflict with Hezbollah, when Israeli infantry units engaged the enemy anti-tank missile armed teams, they were able to easily defeat them while tanks operating on their own suffered several hits from the newest advanced Russian tandem-warhead types such as the Kornet-strong evidence that tanks operating solely on their own in the era of ATGMs have some severe weaknesses. For the most part the NATO armoured doctrine remained defensive, and dominated by use of nuclear weapons as deterrence. Although most NATO nations began the Cold War period with a large number of US designed tanks in their fleets, there was a considerable degree of disagreement on the design of future MBTs among the NATO major nations. Both the US and Germany experimented with, but abandoned the missile-armed MBT-70. The M26 Pershing basic design of the United States would evolve until the M60 main battle tank was replaced with the gas-turbine powered M1 Abrams in the 1980s. The British Army also retained a WWII tank design, the Centurion, which proved to be highly successful and was not fully replaced until the 1970s. 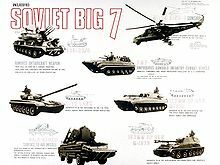 The T-64s and BMP-1s were also joined by the self propelled guns and more importantly Mi-24 Rotary-wing aircraft capable of firing anti-tank missiles entering production in 1970 which were built and theorized as "flying tanks". Normally, multiple platoons coordinate with mechanized infantry and utilize their mobility and firepower to penetrate weak points in enemy lines. This is where the powerful engines, tracks and turrets come into play. The ability to rotate the turret by a full 360� allows coordinated movement within and between platoons, while defending against attacks from multiple directions and engaging troops and vehicles without stopping or slowing down. Picture - A Leclerc tank in a hull-down position. Note the observation periscope which would allow the commander to observe in turret-down position. The deposition of armour around a tank is not uniform; the front is typically better armoured than the sides or rear. Accordingly, normal practice is to keep the front towards the enemy at all times, the tank retreats by reversing instead of turning around. Driving backwards away from an enemy is even safer than driving forwards towards them since driving forwards over a bump can throw the front of the tank up in the air, exposing the thin armour of the underside and taking the gun off the target due to its limited angle of depression. Tanks usually go into battle with a round in the gun, ready to fire, to minimize reaction time when encountering an enemy. The US doctrine calls for this round to be a kinetic energy (KE) round, as the reaction time is most important when meeting enemy tanks, to get the first shot (and possibly the first kill). If troops or light vehicles are encountered, the usual response is to fire this round at them, despite it not being ideal-it is difficult and time-consuming to remove a round which is already in the breech. In this case, after the KE round is fired, a HEAT round would normally be loaded next to continue the engagement. Picture - The Tunguska gun-missile Anti-Aircraft system employs two 2A38M 30 mm autocannons and eight 9M311 SAMs for low altitude air defence. Tanks and other armoured vehicles are vulnerable to attack from the air for several reasons. One is that they are easily detectable-the metal they are made of shows up well on radar, and is especially obvious if they are moving in formation. A moving tank also produces a lot of heat, noise and dust. The heat makes seeing them on a forward-looking infra-red system easy and the dust is a good visual clue during the day. The other major reason is that most armoured vehicles have thinner armour on the roof of the turret and on the engine deck, so an anti-tank guided missile (from an attack helicopter or ground-attack jet) hitting them from the top can be deadly even if it has a small warhead. Even machine guns and small automatic cannon are powerful enough to penetrate the rear and top sections of the engine compartment of a tank. 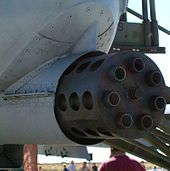 Picture - Close-up of the A-10 GAU-8 Avenger gun. 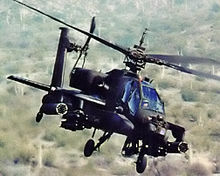 Picture - AH-64 Apache, an attack helicopter designed to destroy armoured vehicles. Similarly, a number of helicopter gunships have been designed mainly to engage enemy armoured vehicles. The AH-1Z Viper, AH-64 Apache, Denel AH-2 Rooivalk, Eurocopter Tiger, Ka-50 Black Shark, Mi-28 Havoc, and Westland Lynx are examples. Helicopters are very effective against armoured vehicles for many reasons. The AH-64D Longbow Apache, for example, is equipped with an improved sensor suite and weapon systems and the AN/APG-78 Longbow Fire Control Radar dome installed over the main rotor. Helicopters however have proved highly vulnerable to small arms ground fire, and so most missions that would have originally fallen under the domain of the attack helicopter are instead being executed by the much more heavily armoured A-10. Airborne threats can be countered in several ways. One is air supremacy. This is what the United States relies on most, which is demonstrated by their distinct lack of effective short-range, mobile air defence vehicles to accompany armoured units. Most other countries accompany their armoured forces with highly mobile self-propelled anti-aircraft guns such as the German Gepard or the Soviet 9K22 Tunguska, short and medium-range surface-to-air missile systems such as the SA-6, SA-8 and SA-11, or combine both on the same vehicle (the Tunguska for example can also host SA-19 SAM missiles). The usage of anti-aircraft rounds fired from the main gun of a tank has been increasing over the years. An example is the HE-FRAG round from the T-90 which can be detonated at a set distance as determined by the it's laser range finder. Armoured recovery vehicles (ARV)-many of these are based on the chassis for the vehicle they support. E.g. the ARV for the UK Challenger tank is a Challenger hull onto which a winch is added. While tanks are seen as being integral to armoured warfare, in forces with a remit of power projection deployability has always been a consideration, which conventional main battle tanks cannot provide. It takes a few weeks to transfer tanks and their supporting equipment by air or sea. Some tanks and armoured vehicles are transportable by helicopter, dropped by parachute, or carried by air transport. The largest transports can only carry one or two main battle tanks. Smaller transports can only carry or air drop light tanks and APCs such as the M113. The desire to create air portable armoured vehicles that can still take on conventional MBTs has usually resulted ATGM armed light vehicles or in protected/armoured/mobile gun system style vehicles in which a lack of armour protection being in part offset by the provision of a first look/first hit/first kill capability through the mating of a powerful gun to superior targeting electronics, a concept similar in operation to that of the US tank destroyers of WWII. Vehicles which have put such considerations into practise include the Stingray light tank, AMX 10 RC and B1 Centauro. Most such US projects to create such vehicles have been abortive, e.g. the M8 Armored Gun System, the most successful, being the flawed M551 Sheridan light tank. This tried to produce an air-portable vehicle capable of destroying conventional by the inclusion of a revolutionary (for the time) 152 mm CLGP launcher. Being able to afford the sea-basing conventional MBTs in possible trouble spots and being able to fly crews to meet pre-positioned equipment the US had a less pressing need of such vehicles than some other nations. Though the experience of limited conflicts such as the insurgency in Iraq rarely involves combat between armoured vehicles, the lack of security has resulted in the application of armour to light vehicles, and the continued use of armoured transports, fighting vehicles and tanks to protect against ambushes and Improvised Explosive Devices (IEDs). Its latest experience of expeditionary warfare has seen the US return to the armoured gun system type vehicle in the form of the Stryker Mobile Gun System. Zaloga, Steven J. Japanese Tanks 1939-45. 2007; Osprey. ISBN 1-84603-091-8.